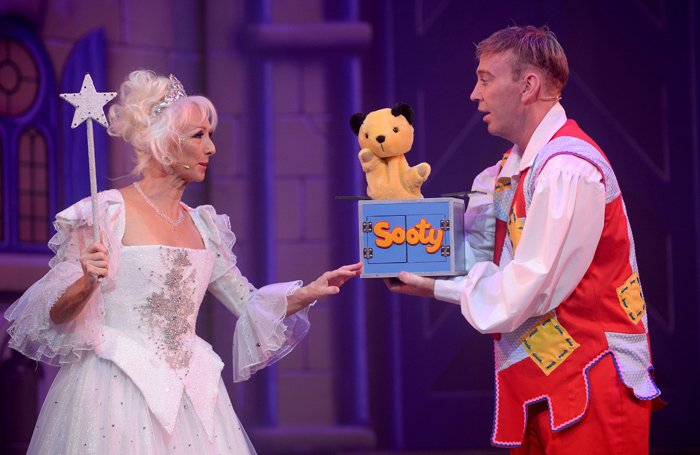 Benefiting from a serious dose of kids’ TV nostalgia, Sleeping Beauty at Wolverhampton’s Grand Theatre is a warm-hearted pleasure. Director Ian Adams shapes the production around his cast’s assorted variety acts, showcasing some elegant ballroom dance breaks, and replacing most of traditional panto’s hoariest routines with a succession of slick, increasingly impressive magic tricks. As enthusiastic a foil as you could hope for, Richard Cadell steals the show as canny jester Muddles, thanks largely to mischievous, fondly remembered glove puppets Sooty and Sweep – who bring the house down at one point with a squealing rendition of Nessun Dorma. Though Cadell keeps the energy big and the banter silly, his interactions with the child volunteers drawn from the audience are delightfully gentle. Debbie McGee evidently enjoys herself as Fairy Crystal, loading her lines with breathless ad libs, while local comic Doreen Tipton gets great laughs with her appealingly offbeat character comedy. Kelvin Towse’s score features a cheerful mix of tapdance jazz and well-curated pop, which breaks into cinematic melodrama at key moments. When a massive, budget-consuming dragon takes flight over the audience’s heads, the effect is suitably heightened by the burst of tense strings that accompany it.